I am sure that among you there are a lot of people who can say that winter is their favorite season, and that Christmas is their favorite Holiday. 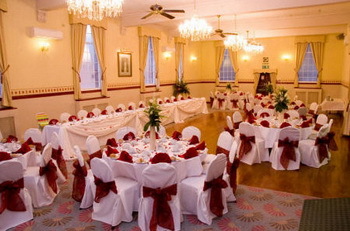 For all those people there is no better time for their wedding than Christmas. Your family is gathered, your house and the church is decorated, all you need to do is choose to have a special Christmas Wedding. 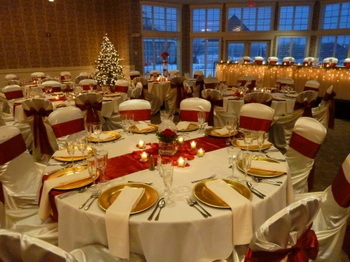 Keeping in mind the fact that you are having a Christmas wedding you should consider having a red and white dress with a red and white cap. But, if you don’t want to ruin the tradition, white is still e perfect choice for your Christmas wedding dress. Since your wedding theme can never be complete without your groom, so his attire must also reflect the Christmas wedding theme. 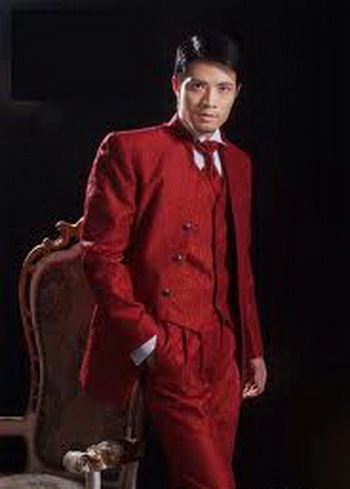 You can ask your groom to wear a black tuxedo with a tie bearing any of the dominant colors of the season. Ask him to wear a tie in the matching color to complete the look. Go for cuff links that have imprints of olives, berries or mistletoe on them to make him look completely ready for the theme wedding. When I think about Christmas I have in mind three colors: white, red and green. White and red remind me of Santa Claus, and red and green remind me of the elves that help Santa take the gifts to all the children in the world. Moreover, if you choose to keep these colors, you will be able to have a wonderful wedding with a low budget, as you can take advantage of the fact that the church is probably going to be decorated in green and red and white. Other choices of colors include silver and white, silver and light blue, forest green and gold, or gold and cream. You can dress your bridesmaids in your wedding colors, give them long wraps or sparkly accessories, all of which will help evoke your theme. 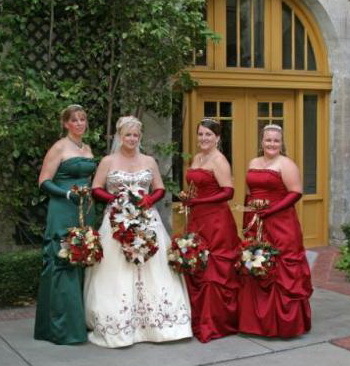 If I had a Christmas wedding I think I would like my bridesmaids to be dressed as Santa girls. For a Christmas wedding , Christmas lights are a must. Decorate your church or ceremony location with white lights and tulle – the perfect Christmas wedding idea for a snowy, romantic effect. Many churches will already have Christmas trees up in their sanctuaries, so you won’t even need to provide much more in decorations. 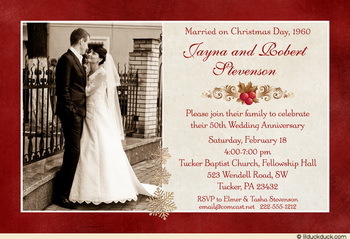 The simplest way to have a Christmas themed wedding invitation is to opt for a thick white card with a border engraved with white snowflakes, or an elegant holly trim. 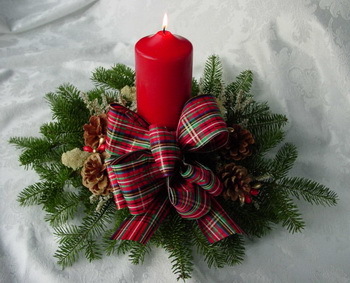 Having pictures like that of a Christmas rose will definitely make your card look attractive as well as suit the theme. Keep in mind that people usually have plans for Christmas, so you may want to send the invitations earlier than usually. 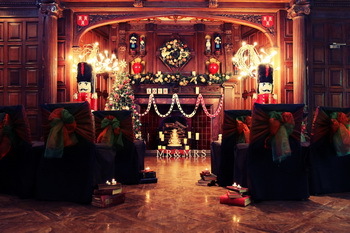 You should choose a ceremony location with a fireplace so that you are able to hang stockings with all of the names of your bridal party on them. This way you can place your special Christmas favor for each of them in their stocking. 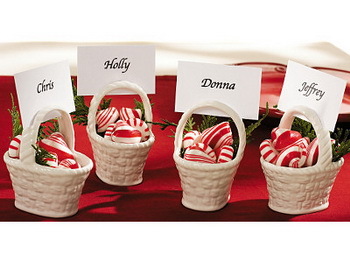 What other favors should you choose for your Christmas wedding besides a Christmas ornaments. If you are into baking, why not bake fruit cakes for wedding favors. You can also opt to bake Christmas cookies or cupcakes. 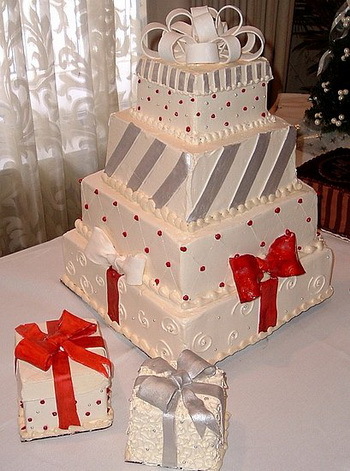 One way of making your wedding cake personalize for your Christmas theme is by choosing to have each tier of the cake look like an individually wrapped package. But you can also choose to have a snow man cake, with a lot of marzipan and almond paste. A sponge or chocolate cake, or even a croquet botcher is also an excellent idea. We can all agree that having flowers at your Christmas wedding can be quite expensive. That is why you should think about alternatives. You could choose a poinsettia in a beautiful pot tied with ribbon. You can also fill a crystal bowl with different Christmas balls; add some ribbons for a unique Christmas table centerpiece. Holly also makes a great, inexpensive decoration, Gypsophila is very Christmassy, and mistletoe is a wonderful Christmas plant. 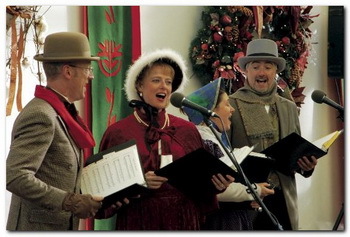 When talking about music for a Christmas wedding the only thing that I have in mind is Christmas Carols. You don’t have to play them during the entire party, but you can dedicate a half hour of your party to listening to Christmas carols. Since Christmas usually comes with snow, what a better way to come to your wedding or leave the party than by a horse- drawn sleigh. 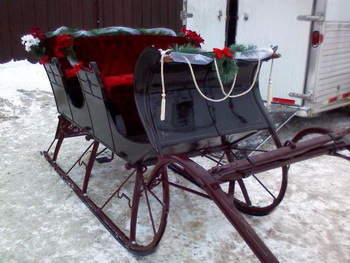 If you do choose to have a sleigh at your wedding, make sure you are properly dressed, because it can get really cold.